Now this is an instant favorite of mine. Go look at Mark Bagley's two-page spread from Captain America Annual #10 and then come right back here. Go ahead and check it out - I'll wait! Okay, welcome back! That spread is one of my favorite pieces, and I've had it since September of 2003. 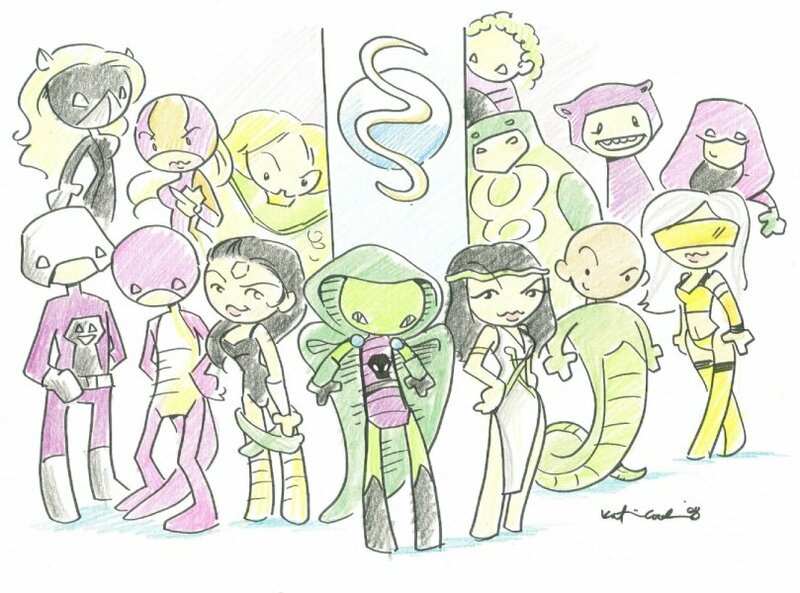 In 2008, Jason W. Gavin commissioned a Serpent Society piece based upon it from Katie Cook, and a friend sent me a link to where he'd shared it online. As you might imagine, I was smitten the moment I saw it. Three years later, for reasons unknown to me, Mr. Gavin put it up for sale and I happily purchased it from him via an eBay auction in September of 2011. I'm lovin' my lil serpents here! The piece is done in sharpie and crayon, by the by. Left to right in front: Rock Python; Rattler; Black Mamba; King Cobra; Asp; Bushmaster; Coachwhip. Left to right in back: Black Racer; Fer-de-Lance; Anaconda; Copperhead; Puff Adder; Cottonmouth; Boomslang.